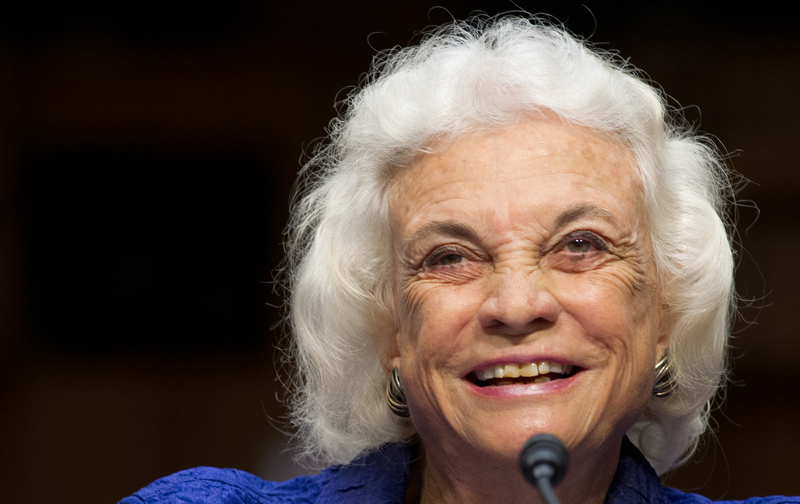 July 7 marks exactly 35 years since President Ronald Reagan announced he would nominate Sandra Day O'Connor to become the first woman ever appointed to the Supreme Court of the United States. After her unanimous confirmation by the Senate in 1981, O'Connor served for nearly two-and-a-half decades before retiring under the Bush administration in 2006. O'Connor, a federalist and a moderate Republican, was known for practicing a case by case approach without arguing for sweeping precedents. During her tenure, O'Connor cast the decisive vote in a number of Supreme Court decisions affecting civil rights, environmental protection, protection against discrimination, and personal privacy. Examples include Grutter v. Bollinger in 2003 that upheld affirmative action, Alaska Department of Environmental Conservation v. EPA in 2004 that allowed the Environmental Protection Agency to take action to reduce air pollution under the Clean Air Act, and in 1992, O'Connor was crucial to the slim 5-4 confirmation of Roe v. Wade and abortion rights in Planned Parenthood v. Casey. Years after her retirement, the 85-year-old trailblazer continues to be a strong voice and force to be reckoned with. On August 12, 2009, O'Connor was awarded by President Barack Obama the Presidential Medal of Freedom, the highest civilian honor of the United States. Here are some of her most notable quotes spoken throughout her inspiring journey and dedicated SCOTUS services. 1. "I don't know that there are any shortcuts to doing a good job." As discussed in a 1981 New York Times article, O'Connor had "A Reputation for Excelling." The Stanford University and Stanford Law School student graduated with high honors, served as an editor on the Stanford Law Review, and was made a member of the honorary legal organization the Order of the Coif. 2. "Do the best you can in every task, no matter how unimportant it may seem at the time. No one learns more about a problem than the person at the bottom." Before O'Connor found employment as a deputy county attorney in San Mateo, California, offering to work without an office and for no salary, at least 40 law firms refused to grant her an interview, simply because she was a woman. They would simply say, "We don't hire women," recounted O'Connor in a 2013 NPR interview with Fresh Air 's Terry Gross. 3. "Society as a whole benefits immeasurably from a climate in which all persons, regardless of race or gender, may have the opportunity to earn respect, responsibility, advancement, and remuneration based on ability." O'Connor became the first woman to serve as the Majority Leader when elected to the Arizona State Senate in 1973. 4. "In terms of having the American people look at the court and think of it as being fair and appropriate for our nation, it helps to have women, plural, on the court." During his 1980 presidential campaign, Reagan pledged to appoint the first woman to the Court. 5. "I've always said that at the end of the day, on a legal issue, I think a wise old woman and a wise old man are going to reach the same conclusion." Many opposed O'Connor's nomination, including U.S. Senate Republicans, conservative activities, and pro-life and religious groups. 6. "The power I exert on the court depends on the power of my arguments, not on my gender." After a multi-day confirmation hearing during which she testified before the Senate Judiciary Committee, O'Connor was sworn in and became the first female member of SCOTUS. 7. "As a citizen, you need to know how to be a part of it, how to express yourself — and not just by voting." In her first year on the Court, O'Connor received over 60,000 letters from the public, more than any other Supreme Court Justice in history. 8. "It is the individual who has acted or tried to act who will not only force a decision but also have a hand in shaping it." O'Connor writes about the potential of the actions of a single individual in her 2003 memoir titled The Majesty of the Law: Reflections of a Supreme Court Justice. 9. "We pay a price when we deprive children of the exposure to the values, principles, and education they need to make them good citizens." In 2009, O'Connor launched a website called Our Courts that offers interactive civics lessons to educate students and teachers in order to fill the knowledge gap about the court system and U.S. government. 10. "We don't accomplish anything in this world alone... and whatever happens is the result of the whole tapestry of one's life and all the weavings of individual threads form one to another that creates something." Throughout her days as Justice and well into her retirement, O'Connor continues to be honored with numerous awards. In addition to the Presidential Medal of Freedom, among O'Connor's many awards are the Liberty Medal from the National Constitution Center in Philadelphia, the Jefferson Award Foundations' U.S. Senator John Heinz Award for Greatest Public Service by Elected or Appointed Official, and she was the third woman ever awarded the Sylvanus Thayer Award by the United States Military Academy. 11. "The destiny of the woman must be shaped to a large extent on her own conception of her spiritual imperative and her place in society." The groundbreaking former Justice continues to be an inspiration, especially to women. 12. "In order to cultivate a set of leaders with legitimacy in the eyes of the citizenry, it is necessary that the path to leadership be visibly open to talented and qualified individuals of every race and ethnicity." O'Connor has said she wasn't expecting that life-changing call from Reagan in 1981. While the world was working against her, the Supreme Court's first female justice worked even harder to carve out her own path, for herself, and for future leaders.